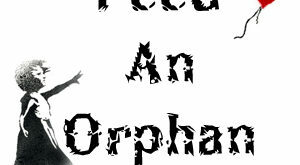 A wedding took place with the children of an orphanage …. & few relations from either sides. May allah bless them, Alhamdhulillah! We must share this to encourage these types of acts, in sha Allah. In a time & era where everyone wants to make their wedding an extravagance event, here is a wedding that made a big difference in many people’s lives challenging our perspective of what a wedding ought to be.. 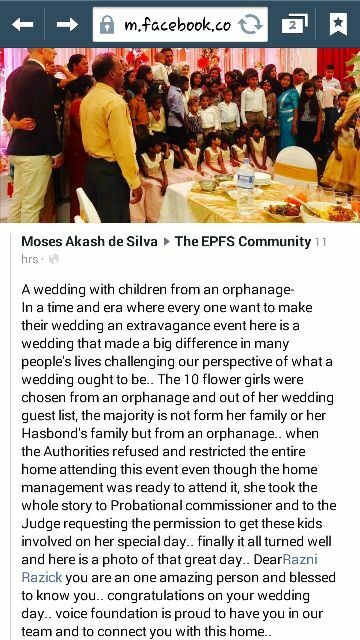 The 10 flower girls were chosen from an orphanage & out of her wedding guest list, the majority is not from her family or her husband’s family but from an orphanage.. When the authorities refused and restricted the entire home attending this event, even though the home management was ready to attend it, she took the whole story probational commissioner and to the judge requesting the permission to get these kids involved in her special day..
Dear Razni Razick, you are an amazing person & blessed to know you. Congratulations on your wedding day… Voice foundation is proud to have you in our team & to connect you with this home..